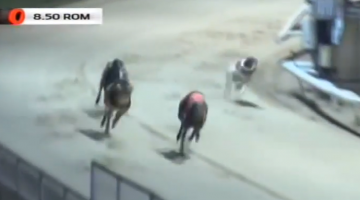 Graham Holland was the most underwhelmed man at Shelbourne on Thursday night as he drove away with four Boylesports Derby heat winners and near track record performances from Sonic and Clares Rocket. The 2016 beaten Derby favourite Sonic was just two spots outside Tyrur Van Gaal’s clock with a 29.12 run. Clares Rocket was, uncharacteristically put in the shade by his kennelmate with a ‘mere’ 29.16 run. The quartet came courtesy of Clonbrien Hero in 29.65 and Droopys Cabaye (29.63). Holland said: “I wasn’t too surprised by either Sonic or Rocket. I knew there were both very well and I’d be a fool to claim that there is plenty left in them, but they are where they are. Rocket hasn’t taken a lot of getting back fit, he came back from England in good shape. “Sonic took a bit more work. He didn’t really take to Nick Savva’s gallop, he wasn’t putting the work in. Nor did he take to Towcester, he wasn’t trapping well and the straights were too short for him. We know we have to work him because he is so keen and gets himself too fresh. bk D Aug 15. Dubai-Racing-Club-Synd.